There are very few authors who write for middle grade readers as well or better than Louis Sachar. He understands what this age is going through with a wide variety of family life styles, and school and peer pressure. Sachar is able to write characters that are instantly relatable to readers but manage to not be just cardboard stereotypes. Fuzzy Mud, Sachar’s latest book, has all the mystery and tension and friendships and school issues that you might have come to expect in one of his books, but the core of the story is rooted in science (a popular topic, I’ve noticed, in a lot of fiction these days). This science is slightly science fiction, but only slightly, and I know that the label might put off some readers. The every-day story of Woodbridge Academy middle-schoolers Tamaya Dhilwaddi, Marshall Walsh, and Chad Wilson is interspersed with transcripts from US Senate hearings on a scientific discovery/advancement and an ecological disaster. The relationship and merging of the two, seemingly different stories becomes clearer and clearer as the book progresses. The science in the book, as presented through the Senate transcripts is really one of the more fascinating parts of this book and should open up a lot of conversations in the classrooms about the needs and inherent dangers of precisely this kind of work. The Tamaya/Marshall/Chad relationship rings true, though the outcome is probably a little rosier than what typically happens with bullies and nerds. Author Sachar has placed himself as a front-runner for another Newbery with this book (not released until August 2015). The science, the relationships, the mystery, and even the smaller bits of information that he manages to include in the book (can you write, simply and in detail, instructions on how to blow up a balloon?) are all hallmarks of award-winning books. Thanks to Delacorte Books and NetGalley for sharing this. Louis Sachar is not an author who needs advanced reviews … I suspect his books will sell well without any publicity, but for a reviewer, it is very nice to get a book by a noted author such as Mr. Sachar. Looking for a good book? 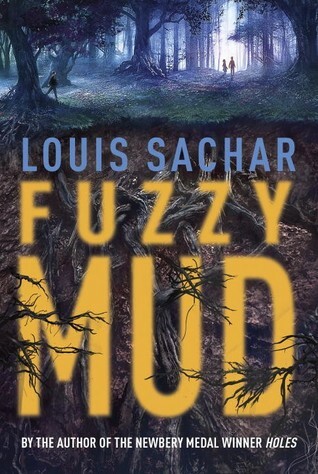 Fuzzy Mud by Louis Sachar is a book that will be read, enjoyed, and much discussed by middle grade students around the world, and YOU should read it too.